I have been making this wrap for years now. I think it may even be the first recipe that I made with tempeh. I got it from a blog (I think). I tried searching for the original recipe, but can't find it anywhere! So whoever started this recipe, thank you so much for endless nights of tantalizing taste buds! 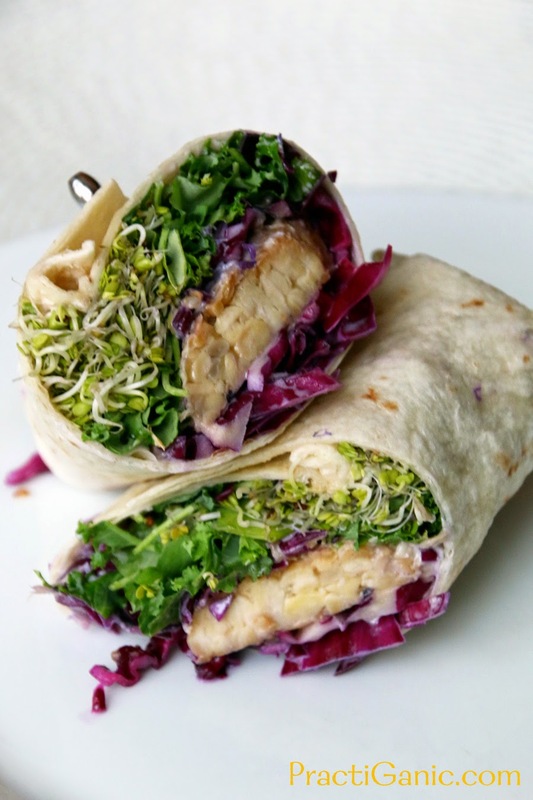 Over the years the recipe has changed little by little, adding a marinade to the tempeh, different flavors on the greens, more greens to the wrap, but the original taste of the pineapple wasabi sauce is the same! It is one of my favorite sauces that I make. The sweet tangy pineapple along with the zesty wasabi in unmatched. I usually double the sauce, just to have extra the next day. I feel that tempeh is another one of those ingredients that people either love or hate. If they're on the hater side, I am convinced they just haven't had it prepared right. I have always loved tempeh, but as of the last year, I love it even more. What changed you ask? I know always marinade my tempeh before cooking it. Once it's cooked, I put it back in the marinade for one last coating. The marinade flavor comes through better, which in my opinion, tempeh needs because it doesn't absorb marinades quite like tofu. Since I'm bringing up tofu, you could easily use tofu in place of tempeh, but tempeh is actually the healthier option. It has a nutty flavor and is much more dense. Tempeh is fermented soy beans, making it easier to digest than other beans. The entire bean is fermented, making it a great source of protein, fiber and antioxidants. It actually has over twice the amount of protein as tofu does ... usually 15-20 grams / 4 ounces (depending on the brand)! Some new studies even show that the way your body absorbs the calcium is almost equivalent to how bodies absorb the calcium in cow's milk! 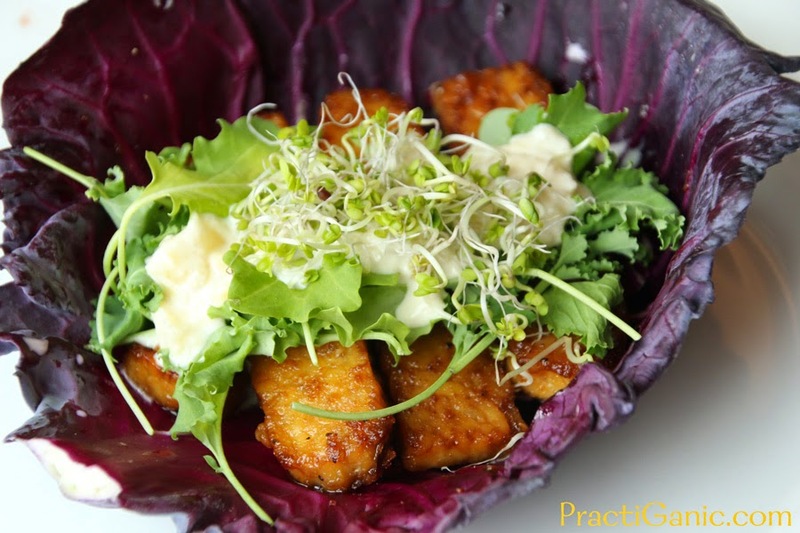 I usually lean towards tempeh for my meals and leave tofu for sauces and desserts. It is completely preference, but hopefully the nutritional boost of tempeh helps you give it a few more glances next time you're debating tempeh vs tofu at the store! 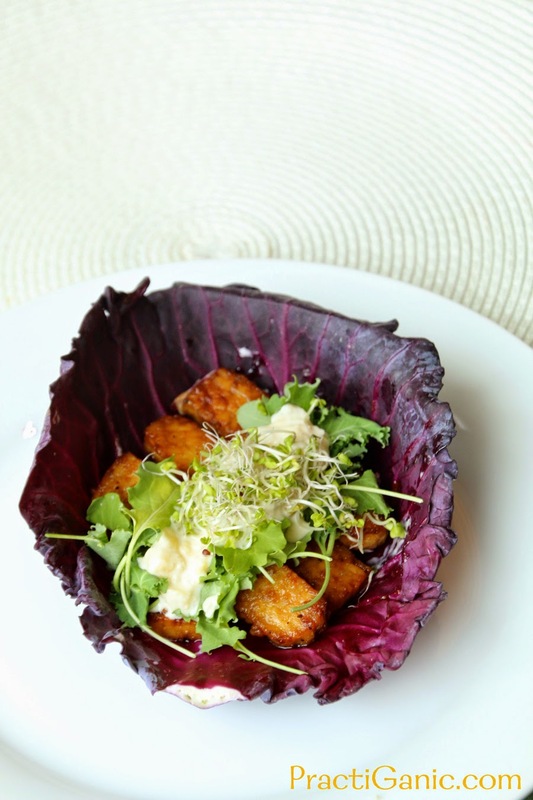 *To make gluten free, use cabbage leaves as your tortilla and use more spinach to mix with the rice wine vinegar and lime juice instead of the cabbage. Cut tempeh into 2 inch by 1/2 inch slices. Mix together the marinade of olive oil, tamari, garlic powder, onion powder, salt and pepper. Pour the marinade over your tempeh and leave it for at least 2 hours, flipping it around every now and again making sure everything is getting coated. Meanwhile, mix the vegenaise, wasabi, pineapple and ground mustard in a bowl. Set aside. 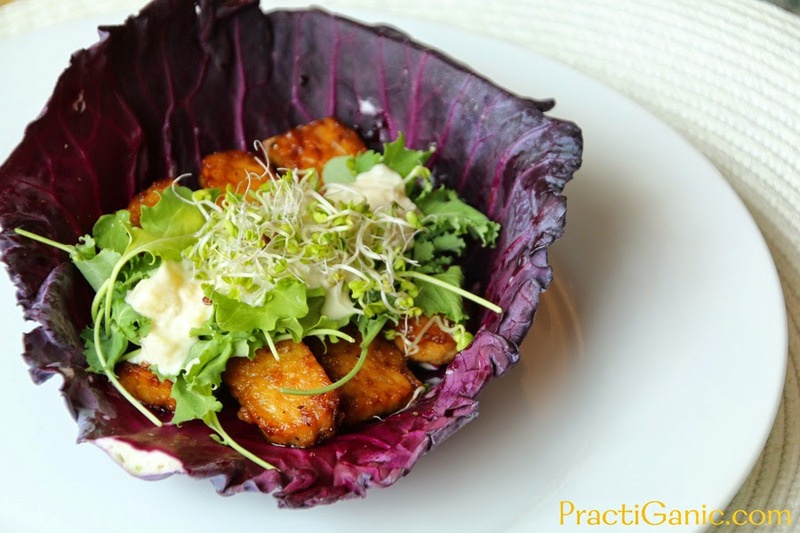 In another bowl, mix your cabbage, scallions, rice wine vinegar and lime juice (if you are making them gluten free, use more spinach or other greens instead of cabbage and use large cabbage leaves for your wrap. Set aside. When you are ready to start cooking, heat a little oil in a pan. Take your tempeh out of the marinade (reserving the marinade for later) and lay them flat in your pan on medium heat. Cook on both sides for about 5-6 minutes or until nicely browned. 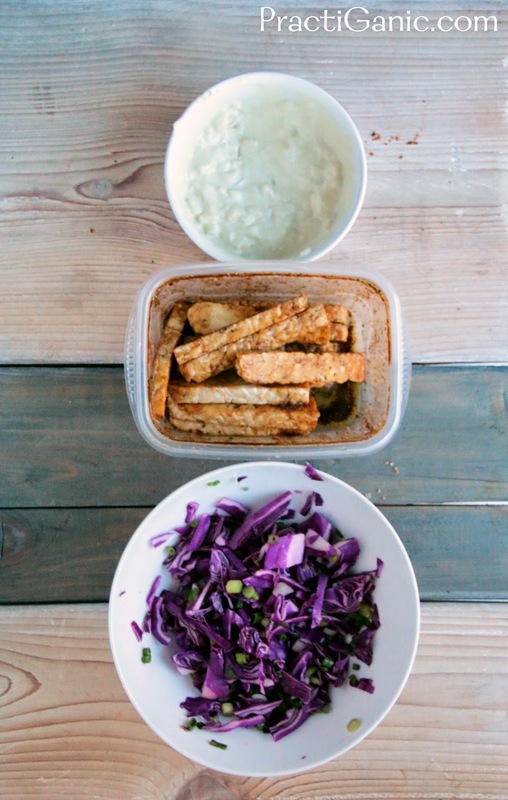 Once done, throw the tempeh back in the marinade to get even more flavor on them! 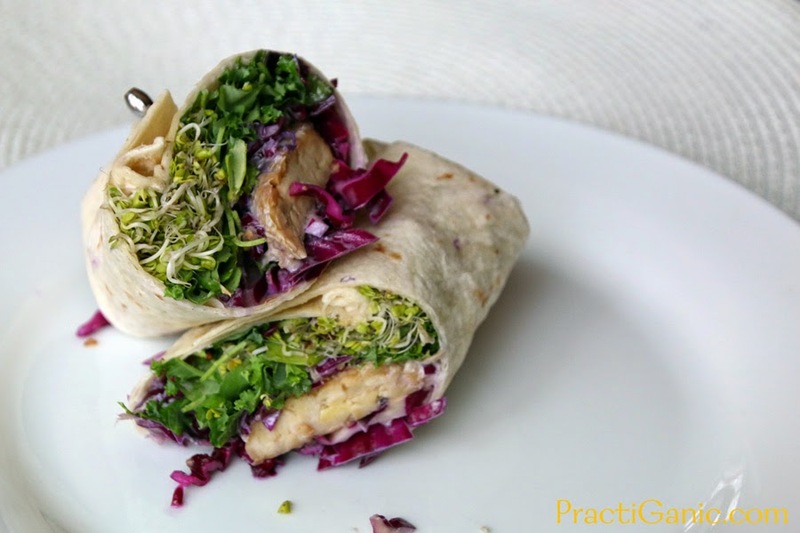 Finally, assemble your wraps with sauce, tempeh, cabbage mixture, greens and sprouts. Wrap it up and enjoy!